Hello all, first and foremost a big thanks for sending your good wishes through comments, emails, messages and phone calls. Sorry for keeping some of you guessing all this time. Yes, new flower did blossom in our garden this summer and I have wanted to share this happy news with you all for long time. It’s been little over 2 months since our baby boy Paarth came to this world and changed our world forever. Wow wonderful pictures Sia..congrats again..
Congragulations. Heard the news in FB .Loved the pics and the quotings. Many many congrats Sia, wonderful pics , Baby P is soooooooooo cute ! 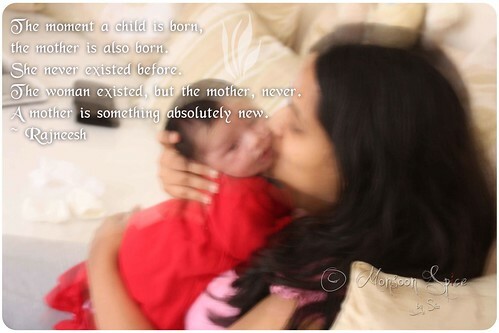 Beautiful clicks, hugs to the ur baby P..Awesome quotes..
Congratulations once again, Sia! Paarth is a cute baby! Beautiful pictures...Congrats and enjoy motherhood! Hearty congratulations Sia, those toothless grins are very precious. congratulations,..such cute pics,. 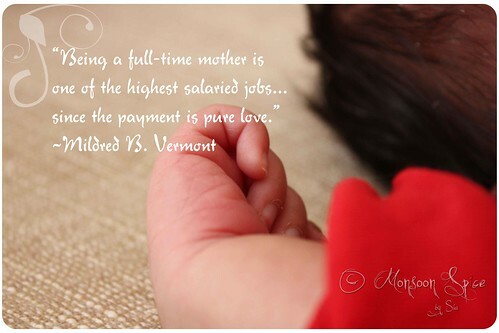 :-) i trully agree with the last quotation about being full time mom,. ;-) enjoy,..
Congratulations Sia !!! What a beautiful news. Lots of blessings to baby Paarth and lots of recovery wishes to you. Hi Sia, Congrats! Have a wondeful time. You will always treasure these moments. Congrats Sia! May God bless both of you and cherish your time with the baby. Feeling so so so Happy for you, Sia!! Enjoy Motherhood!! God Bless the family!! first time here..you hv a lovely space..
btw, congratulations on the arrival of your bundle of joy..have fun! take care! Paarth is a beautiful baby! 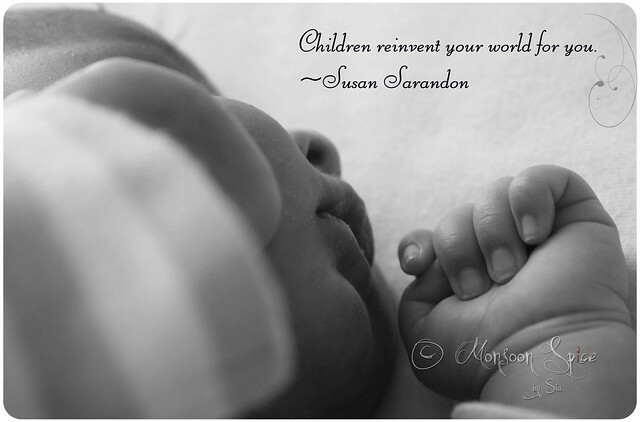 and motherhood is precious. Enjoy dear Sia, for I really really miss the gummy smiles and the way they cry during the first few months and the tender weight of their head on my chest.. i miss everything :-) every moment is so special. Enjoy! and Congrats! Lots of best wishes to you and your family and hugs to baby Paarth! Been following your blog for a long time now. Congratulations on the arrival of little Paarth. Ahhhh.. He looks adorable.. Paarth is a nice name. Hearty Congratulations.. Sleepless are going to get better soon. Enjoy your bundle of love. Sia, Congratulations! Thanks for the most beautiful pictures. Congrats Sia...Enjoy motherhood...Little P is soooo adorable. Congrats again Sups! Beautiful pics..
Those are really beautiful pictures and Congrats and enjoy the pleasures of motherhood. Congratulations! Another little miracle in the world! Beautiful pictures.. baby P is really cute.. The baby is so beautiful and so is his name. I wish you a very pleasant motherhood filled with joy and happiness. Sia Baby P is gorgeous. You'll be sleep deprived but so happy. In time the body clock will get back and you'll find your own rhythm. Enjoy every moment! Congratulations Sia! Best wishes and blessings to the little wonder. Enjoy motherhood. Hi Paarth!! Welcome! WARM hugs and LOADS of love and blessings to U, dear little one! Congrts Sia! Welcome to Motherhood! congratulations. lovely pictures and sweet cute baby. may god bless you and the baby. Congratulationas !! God bless u both !!! Congratulations Sia! I've been checking ur blog for any new updates....miss ur posts.best wishes for ur new role...I'm sure u'll njoy it:) loads of love to baby Paarth! Congratulations Sia! Little Paarth is adorable. Your beautiful post made me relive my intial days as a new mother. Congrats Sia! God bless your little one. Oh what a wonderfuully sweeeetttt blog! !Am happy to be here and heartiest congratualtions to ya!! OMG! I had no idea whatsoever! Honey, hearty congratulations to you and the hubby and your families. This is awesome and what a great blessings. Tight hugs to the new mommy! 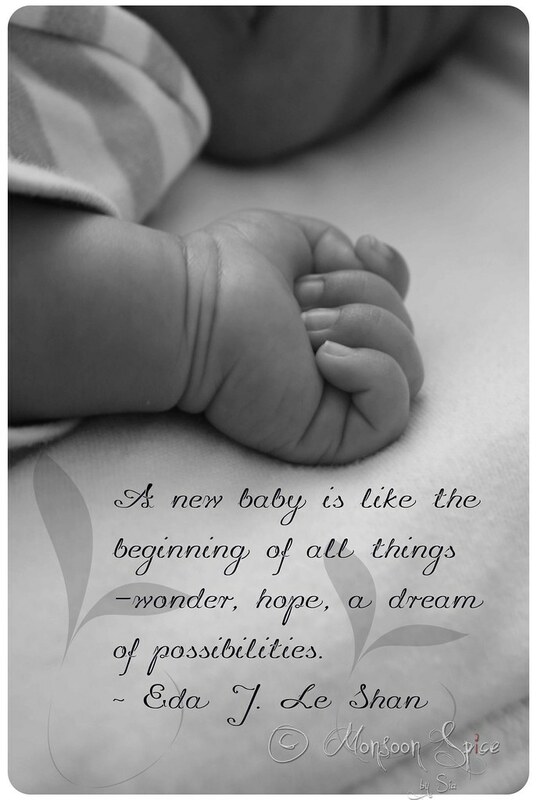 Hi Sia - Blessings and love to both new borns..Parth and well as Mommy. Was checking your blog regularly for an update on the new bloom. Congrats on your motherhood! !Enjoy precious time with your baby! !Pis are cho chweet!! Congratulations Sia! i was busy all summer and did very little of blog hopping... I came t your blog to see if you have updated recently and nice to know about the new addition to your family. Enjoy every moment with your little prince! BTW, Paarth is very cute! Congrats Sia!! Baby is adorable!! Hope you are having a great time with Paarth. Congratulations to you and wish you lots of good wishes. How areyou?Its been long right. But very happy to see the good news..congrats...takecare..sweet kisses to cutiepie..
Just in case you still check this blog... Happy New Year to you and the family! Girl.. Lovely pictures! Congradulations on the new addition!! Its a lovely pic & a beautiful blog. Paarth must be crawling and keeping you busy I think. How are you both doing? Take Care..